This tool converts Japanese dialogue response text into text that "Facial Animation (LIP) Generator" in Creation Kit can "pronounce". 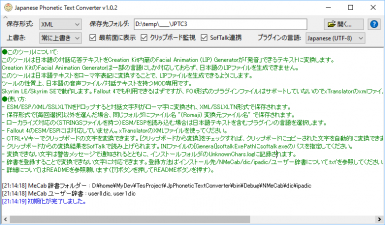 The Facial Animation Generator of the Creation Kit supports only a few languages and can not generate Japanese LIP files. You can not redistribute my files without my permission. 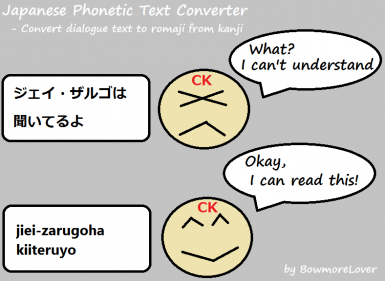 Japanese Phonetic Text Converter Copyright(c) 2017, BowmoreLover, All Rights Reserved. LZ4 Library Copyright(c) 2011-2014, Yann Collet, All rights reserved. NMeCab was ported from MeCab by Tsuyoshi Komuta, and is released under any of the GPL (see the file GPL) or the LGPL (see the file LGPL). MeCab is copyrighted free software by Taku Kudo and Nippon Telegraph and Telephone Corporation, and is released under any of the GPL (see the file GPL), the LGPL (see the file LGPL), or the BSD License (see the file BSD). kanaxs ex C# Copyright(c) 2011, DOBON! , All rights reserved. This tool converts Japanese text to the Roman alphabet notation so that it can generate LIP file. Due to the nature of the tool, it is only for mods with Japanese audio files/dialog text. It works with Skyrim LE/Skyrim SE. 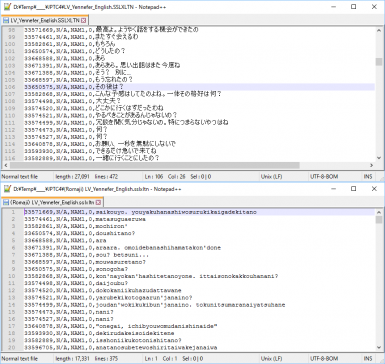 Fallout 4 can also be used, but since FO4 plugin files are not supported, please use xTranslator's xml file. 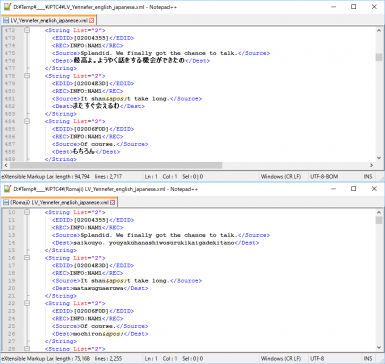 Because it uses the language specific API of Windows to handle Japanese, it works only on Japanese edition or Japanese language pack installed Windows. Japanese text consists of more than about 8000 different characters such as Kanji/Hiragana/Katakana, and the same character has more than one pronunciation, and the pronunciation also changes depending on compound words and conjugations, so it can not be converted simply. This tool uses the NMeCab library to perform morphological analysis and judge pronunciation. - Lazy Voice Finder http://www.nexusmods.com/skyrim/mods/82482/? http://www.nexusmods.com/skyrimspecialedition/mods/8619/? Development by BowmoreLover. All of the program was coded myself by scratch expect following libiraries/tools. Pioneer of Skyrim translation tool. It's thanks to you that we can translate Skyrim mods. McGuffin , the author of xTranslator http://www.nexusmods.com/skyrimspecialedition/mods/134? Extraordinary software engineer. It's thanks to you that we can translate Skyrim mods more easily. The information on this page is very helpful to me. and thanks for all over the modding community, Nexus Mods, and of course Bethesda. Copyright(c) 2011-2014, Yann Collet, All rights reserved. Nippon Telegraph and Telephone Corporation, and is released under any of the GPL (see the file GPL), the LGPL (see the file LGPL), or the BSD License (see the file BSD). Copyright(c) 2011, DOBON! <http://dobon.net>, All rights reserved. - Yennefer of Vengerberg - The Witcher 3 Voiced Standalone Follower by Levionte http://www.nexusmods.com/skyrim/mods/69939/? - Yennefer of Vengerberg - The Witcher 3 Voiced Standalone Follower - Japanese Voice Patch by Levionte and BowmoreLover http://www.nexusmods.com/skyrim/mods/81314?